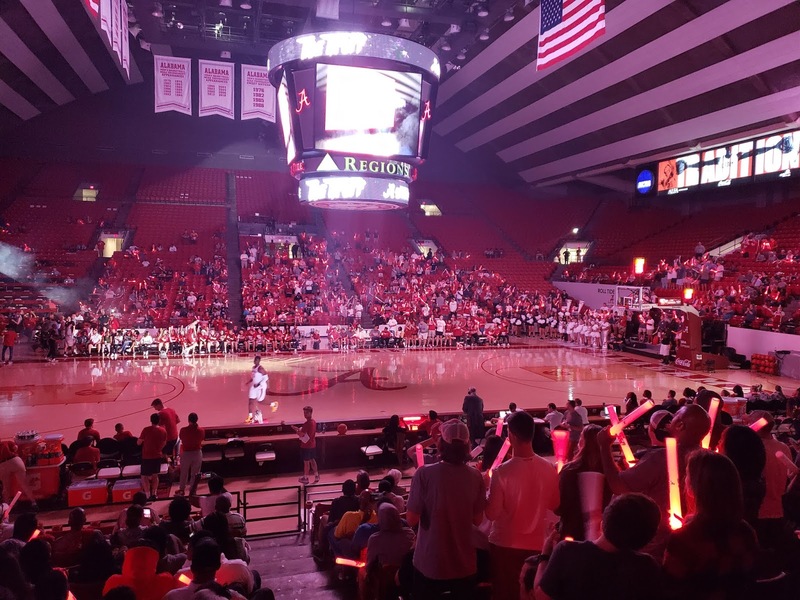 Following a very concerning stat line in a lopsided scrimmage loss to Jacksonville State, Alabama responded with a dominating win in the exhibition game against in-state division II foe Montevallo. Riley Norris was out with a medical issue and will probably miss the next week or two. Javian Davis Flemming missed the game with a sprained knee, and Dan Giddens was also out with a sprained ankle and was in a boot on the sideline. It's hard to tell much from a game like this, while Montevallo is traditionally a very competitive division 2 program, as MSmilie noted in his preview they are a bit of an unknown quantity this year, and frankly I think they probably aren't as good as they've been in the recent past. Nevertheless, this was exactly the type of game Bama needed to restore some confidence with many fans who may have been overly concerned with the secret scrimmage results. The starting lineup was 1. Dazon, 2. Petty, 3. Herb, 4. Smith, 5. Hall. We struggled a bit with turnovers and sloppy play the first few minutes of the game, allowing the Falcons to stay competitive into the first media timeout. Petty made a couple of 3s early, but contributed in other ways for the remainder of the contest. The real spark came about midway through the first half when Alex Reese and Kira Lewis entered the game. Reese was a nightmare match-up for the Falcons forwards, and he made a couple of 3s, had some nice assists, and was able to convert some rebounds. He's running the floor well and is looking to be a very well rounded stretch 4. Kira is obviously still young and inexperienced, but is no question the most talented point guard on the roster. He needs to add some muscle, as I could see more elite guards posting him up and pushing him around a bit, but his quickness allows him to play great defense on the perimeter and force some turnovers. In general, we took much better care of the basketball after the initial 5 to 10 minutes. I really liked the scoring balance, as different guys stepped up at different points in the game. This will be a key this season without a go-to lottery pick to rely on like Collin Sexton. Kira, Herb, Galin, Alex, and JP were all in double digits between 10 to 12 each. Free throw shooting was atrocious in the first half, but much better in the second. I was very pleased with the defense. We stayed in a man to man for most of the game, with some press in the first half. Montevallo had a couple of long scoring droughts. I know part of that was the talent disparity, but given the size and athleticism of this team, I think they can be very good defensively. We've got to get better at finishing around the basket though. Tevin Mack was 2 of 8 from the field, and at least half of those misses were decent looks within 5 feet. Mack looks the part, but he's going to have to show he can play to his potential to earn a spot in the starting rotation. I don't mean to just pick on Mack though, the whole team struggled to convert what should have been easy baskets, and those can turn some Ws into Ls against better competition. It will be interesting to see how the starting lineup and rotation plays out. Here's my 2 cents, I did not like the starting lineup last night. I think having both Galin and Hall in makes us a bit too slow and too light on shooters. I also don't like Dazon at the point. I think he's much more valuable as a slasher and defender from the 2 or 3 positions. He turns it over too much at the point, but he does a lot of things well. He's great at drawing contact, but needs to improve his free throw shooting. I expect Kira will be the starting PG by SEC play at the latest, but until then, I would have him backing up AJ. AJ takes care of the basketball and the offense seems to have a better flow right now when he's running it. Personally, based on what I've seen thus far, my starting lineup would be 1. AJ 2. JP 3. Herb 4. Alex, and 5. Hall. Kira, Dazon/Mack, and Galin first off the bench depending on matchups. Riley can back up Alex when he gets healthy, and Giddens and Flemming can work in with Hall and Galin depending on who's healthy, who has the hot hand and who's not in foul trouble. There wasn't much of a crowd, probably less than 2,000. I feel like this game and the other preseason events have not been marketed as aggressively as they were the previous years. I missed the first couple of minutes and then did not get home until after 10:30 p.m., thanks to the fine folks at ALDOT closing 2 of the 3 lanes on I-59 for a 15 mile or so stretch for construction, despite the actual work only taking place in a small one-tenth of a mile area. I can only imagine what a nightmare this is going to be for an 8pm tip-off against a bigger name SEC opponent. If anybody at ALDOT is reading this, please go shove one of those big orange and white barrels up your arse. Up next, we'll be playing for keeps Tuesday night against Coach Johnson's alma mater when the Southern Jaguars from Baton Rouge come calling for a 7pm tip-off at Coleman Coliseum. The game will be broadcast on SEC Network Plus. Wow. A game preview. That means we're preparing to watch an Alabama basketball game. That hasn't always been a pleasant experience over the years, but it's what college basketball diehards like me look forward to. Following what appears to have been a poor performance vs Jacksonville State in a scrimmage, I'm interested to see what the team looks like in this exhibition game. The game time is 7 P.M. CT. The game can be streamed via SEC Network+. Alabama enters the season unranked in the two major polls, and is currently ranked 51st in KenPom's preseason ratings. 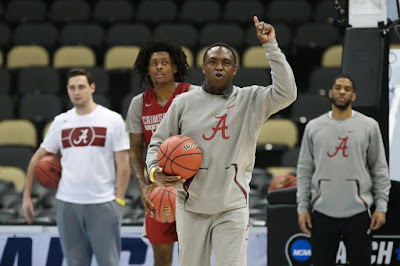 My Two Cents: It's an exhibition game so you should expect the Alabama coaching staff to juggle player lineups and experiment on both ends of the court. You expect them to win of course, but it's not an indictment on the upcoming season if they lose. Auburn lost an exhibition game last season, and went on to win a share of the SEC title. Saturday, February 2 - 7 P.M. CT - at Auburn (TV: TBD) - Recent trips to Auburn have not been pleasant for the Bama program. In the three trips to Auburn during Avery's tenure, Alabama has lost all three games by an average of fifteen points. Unfortunately, this trip won't be any easier. Auburn finished the 17-18 season with a record of 26-8 (13-5), and a final KenPom ranking of 23. After winning a share of the (gag) SEC regular season title last season, Auburn returns three of their top five scorers from that team; plus they return Austin Wiley and Danjel Purifoy after they were forced to miss last season due to a connection in the FBI corruption investigation (I'd make a joke, but let's face it - every school could be affected by this mess before it's all said and done). If Mustapha Heron had returned to Auburn instead of transferring it's probable that the Tigers would have been the preseason favorite in the league. Love him or hate him (I'll take the latter), as long as Bruce Pearl is in Auburn they're going to be a problem. Wednesday, February 6 - 8 P.M. CT - Georgia (TV: SEC Network) - Georgia said goodbye to Mark Fox, and said hello to former Marquette and Indiana head coach Tom Crean. It's a further sign of how the league has committed itself to improving in basketball. Crean may not have returned Indiana to its elite roots, but he did win a couple of Big Ten titles, and also took Marquette to a Final Four. Assuming he can recruit, he should win his fair share of games in Athens. Georgia finished the 17-18 season with a record of 18-15 (7-11), and a final KenPom ranking of 65. Expectations are low for Georgia this season because no one knows how this team will form without Yante Maten on the roster. He was arguably the top player in the league last season, and the Bulldogs still finished 12th in the standings. Is there enough talent on this roster to compete in what looks like an incredibly strong year for the conference? The secret is out. Alabama was pummeled by Jax State in a secret scrimmage today at Coleman Coliseum by the eye-opening score of 92-66. Twitter user @sabanfaux tweeted the box score on social media. A few things that stood out to me: 1] Turnovers continue to be an issue. The team had 25 turnovers today 2] The team was dreadful from the field (21-55 overall, 3-18 from 3) 3] Tevin Mack and John Petty shot a combined 3-13 from the field for a combined 9 points. That's not going to get it done once the games start to count 4] Herbert Jones and Galin Smith appeared to be the only two guys that showed up to play. Herbert was 5-7 from the field, finishing with 18 points, 4 rebounds, 2 assists and a steal. Galin was 6-7 from the field, finishing with 15 points and 4 rebounds 5] The veterans Dazon, Donta, Riley, Daniel Giddens and AJ Jr. were a combined 2-11 for a combined 6 points (not good) 6] Kira Lewis appeared to have a solid game, finishing with 10 points on 3-8 shooting, adding 2 rebounds, 2 assists and a steal. He also only turned it over once. Dazon turned it over five times. It seemed that Dazon was in line to start the season at point, but if he can't take better care of the ball, I say bite the bullet and let Kira jump in the deep end and see how he swims. I think it's important not to take the results of this scrimmage too seriously. It's a scrimmage, and with no media or fans present, it's impossible to know exactly how the scrimmage was set up in terms of player groupings, defensive and offensive gameplans, etc. But it is discouraging to see the team shooting poorly, and key guys like Tevin, JP and the vets having virtually no impact from a stats standpoint. Alabama plays an exhibition on Tuesday night against Montevallo. I'm now much more interested to see that game. I've got an extra pair of season tickets in Section B, Row 8, behind the visitor's bench and a parking pass that I will sell to a blog reader at my cost of $900. ($610 for tickets +$240 Tide Pride +$50 for parking pass). These are my personal tickets, and you'll also get first dibs on buying them in future years as long as my friend continues to sell me his extra pair that I actually use. Email me at jcarruth@whatleykallas.com if interested. I attended the annual BBQ and open practice for Tide Pride and Tuscaloosa Tip-Off Club members last night. 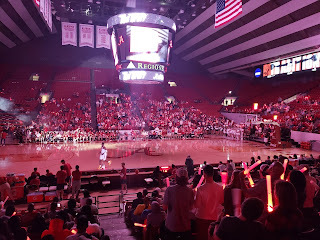 There's not a whole lot to report that is new or different from my observations from the Tide Tip-off scrimmage last week. This year they switched from Full Moon BBQ to Hoos-Q, which was a slight improvement in my opinion. The team was already practicing when fans were allowed in to get the food at 4:30 p.m., so we only got to see the last 30 minutes or so of the practice. They did more offensive and defensive zone work than in the previous scrimmage, and also worked a fair amount on the 2-2-1 press. They ran some rebounding to transition drills, and concluded the practice with a special situation of a tie game, side-out, with 10 seconds remaining coming out of a timeout. Last year when they did that same situational work, the plays were more ISO types with Collin, and trying to get him to be patient enough to wait till under 4 seconds to make his first move so we get the last shot. This year, there was much more off the ball picks and movement, with 3 or 4 guys touching the ball. I will note that Riley Norris had a much better practice than he did in the scrimmage last week. He made a couple of 3s, including one from the corner at the buzzer in the aforementioned end-of-game drill. Petty also shot the ball well and looked to drive in more. Coach Pelfrey took a much more active role in coaching during the practice as opposed to the practices I saw last year when it seemed like Coach Johnson was doing the lion's share of the instructing. Coach Johnson spoke briefly at the end and answered a few questions. The whole thing seemed a bit rushed as he mentioned he had to catch a plane. We later learned he was going to Texas to recruit Drew Timme. I thought it was funny he mentioned our loss to the "eventual world champion Villanova in the tournament." The Golden State Warriors might have an issue with that. He discussed a couple of rule changes that I was not previously aware of. A defender who "hook and holds" in the post can now be called for a flagrant foul after review. The same is also true on a closing-out defender who under cuts a 3-point shooter. I understand they are trying to protect the players' safety, but I don't like either of these rules. It's easy to get arms tanlged in the post or accidentally bump a shooter, and I think a flagrant is too punitive. Dazon in particular is bad about bumping the 3-point shooters, and this could lead to 5 point plays and a loss of a possession. The team will face the Jacksonville State Gamecocks in a scrimmage on Saturday at Coleman Coliseum. It's closed to the public, but if I can somehow find out what time it starts I might try to show up until they kick me out. Saturday, January 5 - 11:00 A.M. or Noon CT - Kentucky (TV: ESPN) - Alabama opens conference play with a big one. The Wildcats had a down season by their standards a year ago. Kentucky finished the 17-18 season with a record of 26-11 (10-8), and a final KenPom ranking of 17. The Wildcats did win yet another SEC Tournament title and advanced to the Sweet 16. But for a fanbase that demands final fours and national titles, the season didn't quite measure up. This season is expected to be more along the lines of what we've come to expect from Kentucky. They will likely be ranked 1st or 2nd in the country when the first polls are released. As usual, the Wildcats lost a number of players to the NBA draft (three of their top six scorers departed). But they also return three key players from last season (PJ Washington, Quade Green and Nick Richards), add the 2nd-ranked class in 2018, and also added arguably the top transfer in the country, Reid Travis (averaged 19.5 ppg and 8.7 rpg last season at Stanford). Kentucky is loaded....again. Tuesday, January 8 - 8:00 P.M. CT - at LSU (TV: SEC Network) - The Tigers are one of the more intriguing teams on paper in the conference. Will Wade's first season in Baton Rouge was considered a success. LSU finished the 17-18 season with a record of 18-15 (8-10), and a final KenPom ranking of 66 despite being picked to finish 14th in the league in the preseason. The Tigers advanced to the second round of the NIT. Will Wade signed a top five recruiting class for 2018. LSU also returns star guard Tremont Waters. In my opinion Waters was the second-best freshman in the league last season, just behind Collin Sexton. Combine Waters and a top five class, and expectations are high in Baton Rouge. - The women's starting 5 can probably play with almost anybody in the country, but beyond the top 5 or 6, yikes. -Depth should not be a problem for the men's team. This is the best combination of size, depth, and experience that we've had in a long time. -Kira Lewis is a bit under-sized, as one would expect for a 17 year old playing in the SEC. He's also fearless. He scored 17 points, mostly in the open court, and showed plenty of raw talent. It's going to be fun to watch him get stronger and improve over the course of the season. -Javian Davis Flemming has great size and will give us some muscle in the post. He showed a few decent moves, and appears capable of setting a good screen without picking up a foul. -Tevin Mack looks the part, and I think he can be as good as he wants to be. He has a nice shot, and made a few jumpers, and also has good quickness and the ability to get to the rim. His shot selection was poor at times, but he's probably going to have nights when he's hot and that won't matter. -Alex Reese and Galin Smith both appeared to be in better physical condition than they were last year, and they should be a bit quicker and more effective. -Herb Jones looked great on both ends of the floor. He even ran the point some. He can lock down 4 positions, and his offensive instincts appear to be improved. He will be the best all-around player on the floor most nights. If his outside shot improves at all he could have a real chance at being a first round NBA draft pick. -Petty handled the ball well and made some plays inside the arc. He will still be the primary three point threat, but I think he's trying to get away from relying exclusively on the jump shot. -Donta Hall showed off his ridiculous leaping ability with a few monster dunks. -Giddens seems more fluid and made some great plays around the basket on both ends of the floor. We've seen flashes from him in the past, but if he's improved to be more consistent we will be difficult to handle in the post. -I've been critical of AJ getting so much playing time in the past, but he could be a key part of this team at PG. He's not going to fill up a stat sheet, but he brings great leadership to the position and the team seemed to have better chemistry with him running point. He gets the guys in position to make plays. -I'm not convinced Riley Norris is 100% healthy yet. He air-balled a 3 and generally looked out-matched most of the night. -Coach Johnson was mic'ed up, and mentioned that we would like to play fast and more in the middle of the floor. He said last year we had a tendency to get too wide and bring the extra defender (in reference to the sideline) into play. He explained a few plays and said we will look to get our bigs the ball at the elbow to open up the defense and with proper off-ball movement we should have some options. -The team as a whole needs to do a better job of finishing. Several times we made great moves to get a good look only to miss a layup. -It was a little sloppy. There were too many fouls, turnovers, and missed free throws, but that's to be expected for an early season scrimmage. Overall, I was very pleased, keeping in mind the standard disclaimer that you can't really tell a whole lot by these types of scrimmages. I plan to attend the Tide Pride BBQ practice next week and will report back. It's great to be watching Alabama basketball again! Tuesday, December 4 - 7 P.M. CT - Georgia State (TV: SEC Network+) - Alabama's second opponent from the Sun Belt conference, Georgia State is expected to be the preseason favorite in the league. They return four of their top five scorers from last season (all seniors), including 2018 Sun Belt Player of the Year D'Marcus Simonds (21.2 ppg, 5.7 rpg, 4.4 apg) and former Alabama player, Devin Mitchell (12.0 ppg, 44.7% from 3). The Panthers finished the 17-18 season with a record of 24-11 (12-6), and a final KenPom ranking of 101. They made the NCAA Tournament for the second time in four seasons. Head Coach Ron Hunter has thrived at Georgia State, compiling a 140-85 record in seven seasons and five postseason trips (two NCAA tournaments). Sunday, December 9 - 12:00 P.M. CT - Arizona (TV: ESPN) - This is a big one. It's not often that Alabama plays host to a top ten program in the sport (Kentucky being an exception, of course), but that's the opportunity they've been given after traveling to Tuscon a year ago. Arizona finished the 17-18 season with a record of 27-8 (14-4), and a final KenPom ranking of 28. The Wildcats won the Pac 12 regular season and conference tournament titles and advanced to the NCAA Tournament. The top five scorers from last season all departed so Arizona could be in rebuild mode this season. The roster has a total of ten freshmen and sophomores on it, but more than enough talent to remain a presence in the Pac 12 standings. Tuesday, December 18 - TBA - Liberty - Huntsville, AL (TV: TBA) - The team returns to Huntsville for the third annual Rocket City Classic. Liberty, formerly a member of the Big South conference, is now a member of the Atlantic Sun conference. The Flames finished the 17-18 season with a record of 22-15 (9-9), and a final KenPom ranking of 184. Liberty returns four of their top five scorers from last season so they have an opportunity to make an early impression in their new conference. Just a few things to post about. 1) Alabama will scrimmage against Jacksonville State on October 27th. These scrimmages are closed to the media and public, but the results typically leak out. 2) Top 50 prospect Drew Timme is in Tuscaloosa this weekend for an official visit. The 6'10, 235 lb center from Richardson, Texas has become a top priority for the Alabama coaching staff. 3) Another priority recruit for the Bama staff is DJ Jeffries, a 6'7, 218 lb forward from Olive Branch, Mississippi. Like Timme, Jeffries is a top 50 prospect. If comments from Jeffrie's father are any indication, Alabama is in his final three schools. The three schools mentioned are Memphis, Mississippi State and Alabama. A decision could come as early as next week. Just talked to @CoreyJeffries10, father of 2019 forward DJ Jeffries. Decision likely coming next week. "Memphis, Mississippi State, and Alabama — they’re neck and neck. It's a battle right now." In just over four weeks, the 2018-19 college basketball season will begin. Alabama will be looking for consecutive trips to the NCAA Tournament for the first time in thirteen years. It won't be easy. Once again, Avery Johnson and his staff have put together a challenging non-league slate. In addition to that, the SEC could be primed for an even better season than a year ago when the league sent a record eight teams to the NCAA Tournament. Tuesday, October 30 - 7 P.M. CT - Montevallo (TV: SEC Network+) - As a result of the NCAA moving up the start date of the season by a few days, we'll be treated to exhibition basketball in October. Montevallo finished the 17-18 season with a record of 15-15 (Conf: 10-10). With only four players from that team returning, head coach Danny Young will be breaking in a lot of newcomers. Tuesday, November 6 - 7 P.M. CT - Southern (TV: SEC Network+) - The official start of the season will come in Coleman against Avery Johnson's alma mater. The Jaguars finished the 17-18 season with a record of 15-18 (10-8), and a final KenPom ranking of 326. In the offseason the school made a coaching change, hiring Sean Woods. In a previous stint in the Southwestern Athletic Conference (SWAC) at Mississippi Valley State, Woods won 61% of his conference games and led MVSU to a SWAC title and an NCAA tournament appearance. Southern returns two of their top five scorers from last season. Sunday, November 11 - 6 P.M. CT - Appalachian State (TV: SEC Network) - This will be a "non-bracketed" game as part of the Charleston Classic. The Mountaineers, from the Sun Belt conference, finished the 17-18 season with a record of 15-18 (9-9), and a final KenPom ranking of 208. The expectation for Appalachian State should be for an improved 18-19 season. The Mountaineers return four of their top five scorers, including leading scorer Ronshad Shabazz (18.5 ppg). The team will also have two D1 transfer players eligible after sitting out a year. I am continuing the season previews this weekend. But before we get to the fun stuff I wanted to post something about the recent allegations regarding payments provided to Collin Sexton and his family by a former runner named Christian Dawkins. These allegations surfaced this past week during the federal trial that is currently taking place in the wake of the FBI investigation into college basketball corruption. Among revelations in court this afternoon, documents suggesting Christian Dawkins paid $5,000 to Collin Sexton and another calling for $1,500 per month to Sexton, $21,000 for travel for his family and a four year job for his brother ($35,000 per year, with $5,000 annual raise). So far nothing has surfaced that shows the Alabama coaching staff knew of this arrangement, assuming it took place to begin with. Obviously, if something were to surface that proved the coaching staff knew of these alleged cash payments, well things would get mighty interesting. All we can do is wait this out and see what develops. For what it's worth: Alabama was just one of many programs that were mentioned in the trial this week. It could get a lot worse before it gets better. For those of us who have grown up as fans of college basketball, when the smoke clears on this investigation and trial, the sport as we've known it may be irrevocably changed.